The typical cost of CoolSculpting, inclusive of our current Exclusive Specials ranges from $600 to $1200 per treatment area, depending on the size of the applicator and the area being treated. We also offer CoolSculpting Packages. These are helpful when multiple or larger areas are treated. CoolSculpting is a very affordable treatment, especially when compared to invasive surgical procedures. 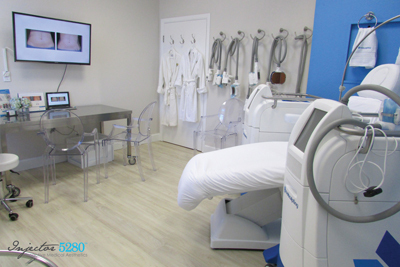 Our certified and experienced CoolSculpting practitioners work with you to customize an appropriate treatment plan. We can also discuss available financing options if needed. We will assess the areas to be treated and the number of cycles needed to achieve your goals. We will then be able to give you an exact price for your CoolSculpting treatments, including any limited time Exclusive Special prices we are currently offering. Injector 5280 also offers patients the option of financing CoolSculpting treatments. This gives you the ability to finance all or part of your CoolSculpting treatment. Financing allows you to begin treatment immediately. Qualifying candidates are able to pay for their treatment over time, with no interest for 15 months. During your complimentary consultation, please ask our certified CoolSculpting practitioners about financing options.